North Texas Roof Inspections - Frisco Roof Repairs - Roofing Company, Roof Repairs, and Roofing Service in Frisco, TX. 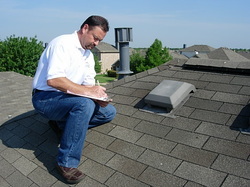 Certified Residential and Commercial Roof Inspectors in McKinney, Frisco, and Plano. If you are in need of having your roof inspected in North Texas, one of our Certified Roof Inspectors can come out and give your roof a full, legal inspection. A Professional Roof Inspection from Frisco Roof Repairs can extend the life of your roof and prevent you from any costly repairs that may not be necessary. If a new roof is necessary, we can work with you to find the best option for you and your budget. A Frisco Roof Repairs, we understand you have an option in Roofing Companies, so we pride ourselves in our honest approach to products and service. We are here to help you. Call us or send us a message using the form on the right, if you would like to talk to one of our Knowledgeable Representatives.